Speedy: So the other weekend, I went up to visit the bro in DC. As I was driving up, I thought this was a great opportunity to stop by Q Barbeque, a small Richmond based chain owned and operated by pitmaster Tuffy Stone. As a big fan of BBQ Pitmasters (and because of Tuffy’s recent win at the Jack Daniels barbecue contest), I was super excited to try it out. 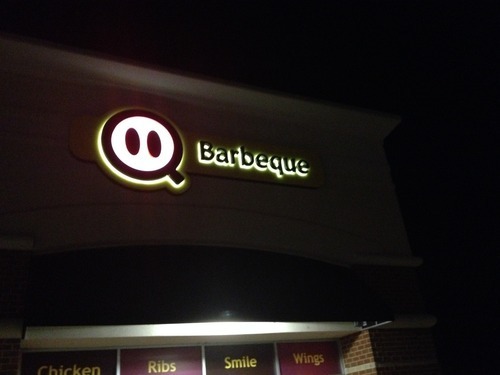 Due to some pre-meal research, I had read about what a Q Barbeque restaurant looks like, but I can’t say that seeing a barbecue restaurant in a strip mall that basically looks like a Chipotle instills much confidence that it will be any good. I will say that Q Barbeque is EXTREMELY clean and organized. 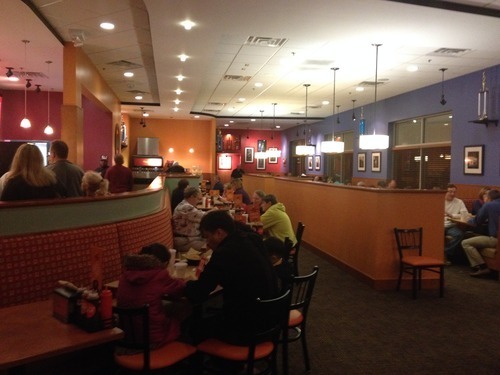 After placing your order and paying at the counter, you’re given a number and a cup to get your drink and find a seat. In order to try as much as possible, I ordered the three meat plate with two sides and got a drink to go with it. 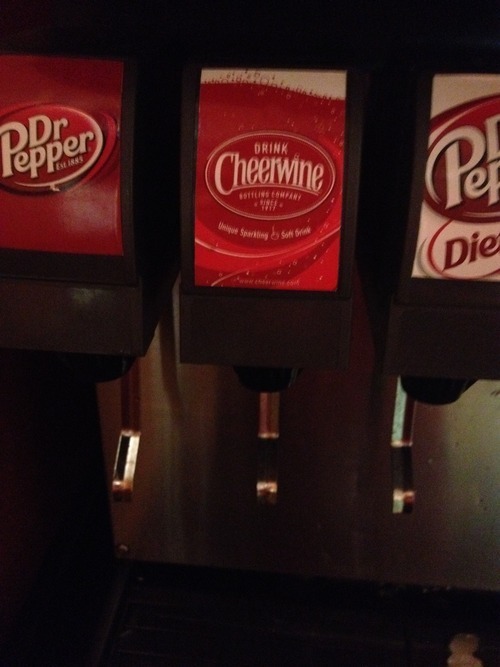 When filling my drink, I was pleasantly surprised to find Cheerwine in the fountain – the meal was off to a good start. After a short wait, the food was brought out to my table. Monk: Nice touch to have Cheerwine available, and in the fountain no less. Definitely unexpected for a joint in Richmond. Speedy: I wasn’t sure what to expect in terms of portion, but the sizes were decent. The three meat plate was too much for one person, but probably not enough for two. 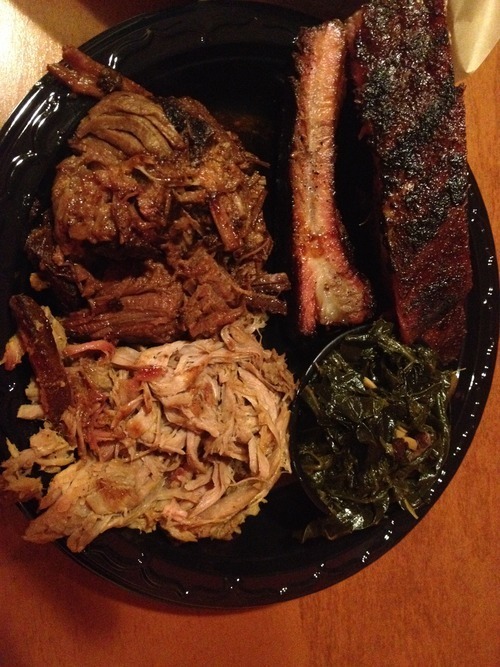 The plate came with three rib bones, a small portion of pulled pork, and a small portion of chopped brisket. Along with the sides, a bun and a pickle spear were also included. Everything looked really appetizing – the ribs were cut perfectly and the pork and brisket were both uniform in color and pull/chop. The only thing left to do was dig in. Monk: Over $20 for one person with no beers seems pricey, but I guess if you get more than a meal’s worth of food it’s not so bad. Speedy: I agree with that, but there was no reason for me to order that much food for just myself except for the fact that I owe it to the readers to sample everything. Well everything except the chicken. 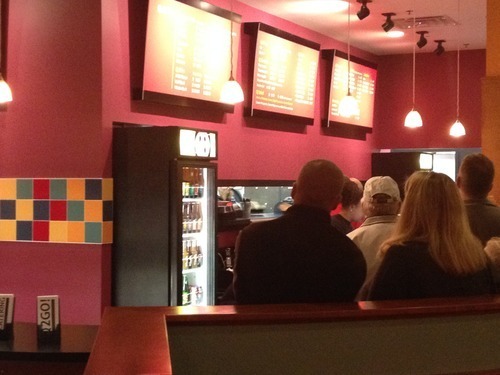 Hopefully none of our readers would even think about ordering chicken here. I first tried the pork without any of the optional sauce on the table. I was worried that it would be dry, but it really wasn’t at all. It had a bit of smoke flavor, but lacked the tanginess that I like that comes along with a vinegar based dip. Overall though, I was pleased with the flavor. 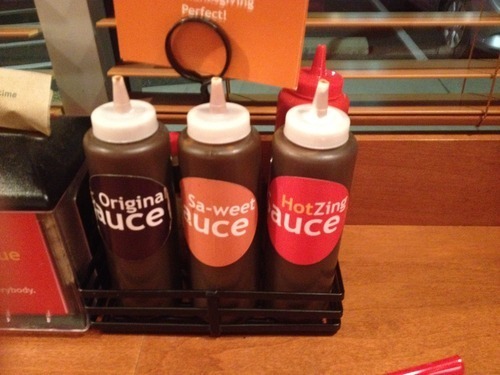 I did add some of the spicy sauce to see what it tasted like, and I didn’t think it really added much. Next I tried the ribs. They were lightly sauced and cooked almost perfectly. The ribs were tender, but not so much that they fell off the bone. Whatever rub was used was fantastic. I think these ribs were probably the third best that I’ve ever tried – behind only Rendezvous and 12 Bones. The ribs didn’t need any additional sauce at all. In the end, I was disappointed that I only had three bones. Monk: Wow, that is some high praise. Speedy: The final meat on my plate was the beef brisket. I’ll be the first to admit that I’m no brisket expert, but I have eaten brisket at several places in Texas. And maybe I don’t know what beef brisket is “supposed” to taste like, but I can’t say I’ve ever had better brisket than the portion I had a Q barbeque. 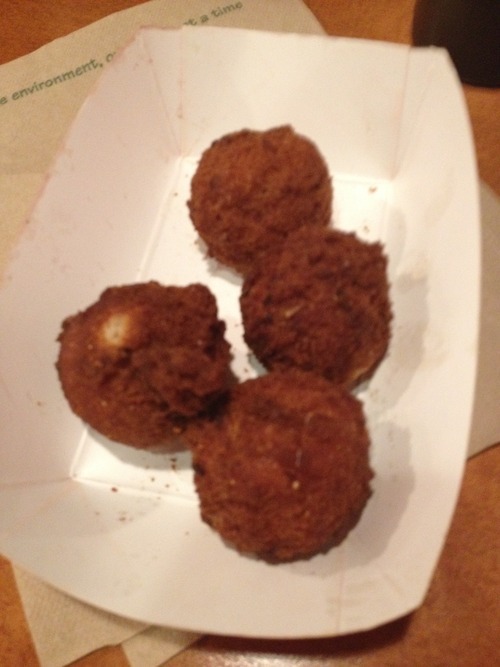 It was tender, perfectly seasoned, and required no additional sauce. In fact, I didn’t want to put sauce on for fear of affecting the taste. I just can’t say enough about how good this brisket was. It is literally so good that I will likely play a role in my fly or drive decision next time I head up to DC. My mouth is watering just thinking about it. Usually, we just glaze over the sides here, which is appropriate for the hush puppies (which were fine, but not worth talking about). However, the collard greens were superb. They tasted more of pork than greens thanks to the bacon cooked in. I’m sure these collards are terrible for you, but it’s really what barbecue sides should taste like. My first thought after the meal was to text Monk to tell him how good it was. Monk: …which I can confirm he did. Thanks for thinking of me, Speedy! Speedy: My second was that of fear. Q Barbeque looks like a place that would cook with gas (based strictly on appearance), so I was concerned that my credibility would come into question for gushing so much over not true barbecue. 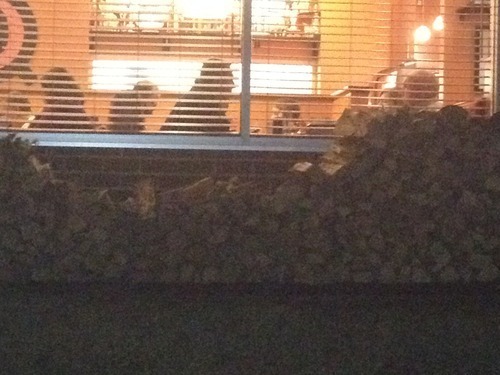 However, I drove around the side of the building to check it out as I was leaving and was very pleased to see a large pile of wood, which I’m assuming was for cooking. I definitely tasted a good amount of smoke in my meal, so it tasted wood smoked. 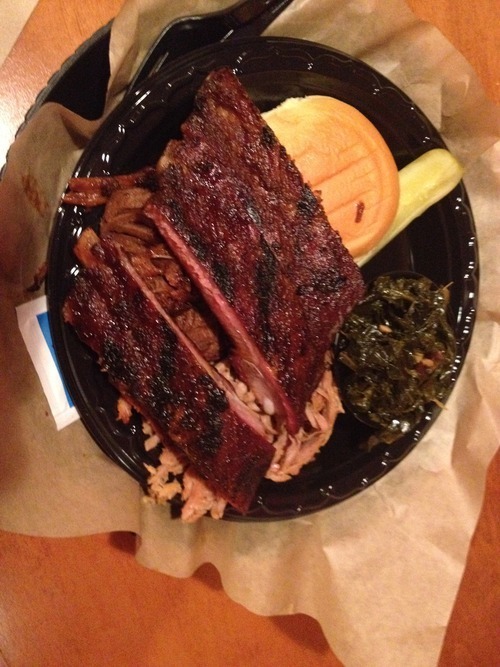 Speedy: Overall, I was very pleased with my meal at Q Barbeque. I knew Tuffy Stone was a great competition pitmaster, but I’m happy to report that it definitely translates to the restaurant. If you’re in the Richmond area, Q Barbeque is not to be missed.